A new Pew Research Center study examines race relations and inequality in the United States. A new Gallup poll identifies the factors that the 53% of Americans that rate Congress’s job performance poor or bad point to when complaining about the institution. The majority say that Congress is distracted from helping its constituents and instead pays “too much attention to financial contributors” (56%) or “too much attention to special interests and lobbyists” (55%). A Pew Research Center poll examines partisanship and political animosity. A new Brookings Institution research paper investigates the demographics of those living in poverty in the United States. 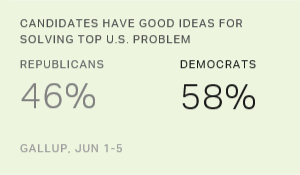 A new Gallup poll shows that Democrats are significantly more confident about the ability of their candidate to solve problems than Republicans are. While Democrats have trended upwards since November, Republican confidence has taken a downturn with Donald Trump as the nominee. 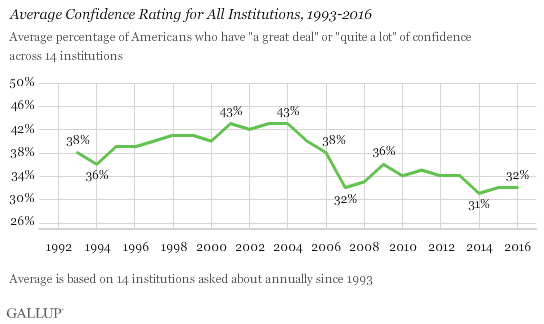 Americans’ confidence in institutions remained low over the past decade, Gallup reports. Among the institutions that lost ground since 2006 are banks (-22), church and religious organizations (-11%), newspapers and television news (-10%), and Congress (-10%). A new Brookings Institution study looks at American attitudes on refugees from the Middle East. 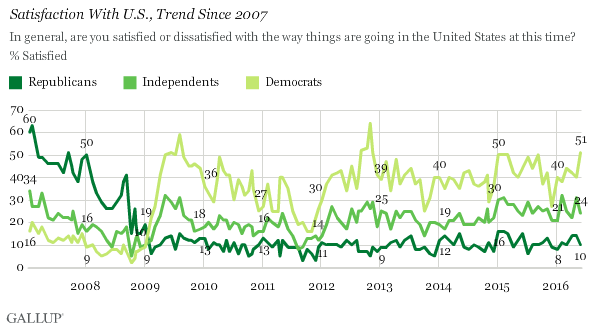 A new Gallup poll shows that only 29% of Americans are satisfied with the country’s direction. The low number continues a downward trend since 2007. As would be expected, party association has played a defining role in polling since 2007. A Pew Research Center poll examines the policy predispositions and demographic factors correlated with Republicans that have warm feelings about Trump. 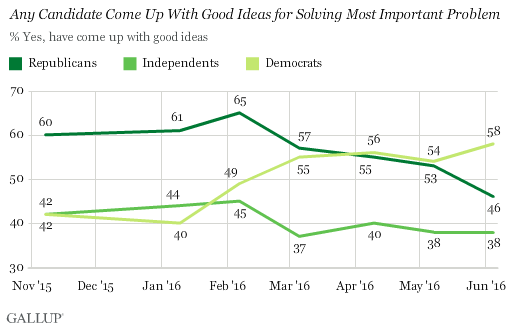 A Gallup poll released today shows that the economy is the priority for American voters in the 2016 election season. When asked what “single issue or challenge” they are “most interested in seeing the President address when he or she takes office,” 19% of Americans said the economy. 14% said immigration, 10% said healthcare, and 9% said national defense. Only 2% said uniting Americans should be the priority for the next President. Pew Research Center released a report on May 5 investigating the American public’s view on the U.S.’s role in the world. Among the findings were a sharp uptick in support for increased defense spending. The logical contradiction of growing public support for increased defense spending and a growing desire for subdued international activity may be explained by threat recognition: Americans are far more likely to see non-state actors as a threat than Eastern rivals.